The fair, now in its eighth year, has also come far. Its bold ambition was to ‘reinvent’ the traditional art and antiques fair, a struggling if not failing model in an age in which minimalism and contemporary art came to prominence. What its organisers understood was that today’s audience expects to be diverted and intrigued but also comfortable, and agreeably fed and watered. So good air and light is needed as well as handsome design, and Urban Caprice is on site to offer pop-ups of three of its renowned London restaurants and bars, alongside a cafe and outdoor champagne terrace overlooking the gardens of the Royal Hospital Chelsea. Like it or not, art fairs have grown to become part of the entertainment business, but it was about time that event organisers remembered that looking at works of art ought to be an enjoyable experience, and that even the most committed collector needs to take a break sometimes. It is, of course, not only the catering at Masterpiece that offers something for everyone. As the luxury goods have gone (although the contemporary jewellery remains), the range of the works of art on offer has expanded, as have the nationalities of the exhibitors. About 40 per cent of the 150 dealers this year come from overseas, as do around 45 per cent of the 40,000 or so visitors. Hewat-Jaboor is keen to demystify the art business, and to help remove any lurking fears that novice buyers often experience when approaching stands or dealers. For one, exhibitors are encouraged to put prices on their labels. ‘Quite often the exhibits are vastly less expensive than people might think,’ he says, enthusing about presenting a ‘sensational small object that is beautiful and the best of its kind and may cost only £750’. One of the reasons why the fair now offers photography and prints is that they often make approachable entry-level buys. Moreover, the market for traditional works of art in particular depends on new buyers discovering what it can offer, an opportunity that has been diminishing over the last 15 years as increasing numbers of antique shops and galleries have lost their shop windows and moved upstairs, and as the auction houses have both narrowed their gaze and closed down their secondary salerooms. ‘With a few exceptions, all you see on Bond Street these days is frocks. It is more and more vital that we raise and expand the game through Masterpiece,’ Hewat-Jaboor says emphatically, lamenting also the diminishing number of tastemakers – collectors and decorators – who understand how to present a range of works of art in an interior. If ‘Masterpiece’s role is to help shape and create taste’, it does so by inviting world-class dealers and hoping for great and diverse works of art and stimulating juxtapositions. Art fairs are about serendipity and discovery. This year certainly sees more joint stands, or stands showing complementary material. Galerie Mathivet, for instance, displays contemporary Aboriginal art in an art deco interior, while Safani Gallery/Geoffrey Diner and Donati Arte Classica/Repetto present antiquities alongside post-war art. Antiquities have emerged as a strength. Rupert Wace brings a 2nd-century Roman marble relief fragment of a bull probably from a large public monument, its creased flesh, heavy dewlap and curling forelock naturalistically rendered (£90,000). Lions prance along the sides of the cheek panels of the 6th-century BC Corinthian bronze helmet offered by David Aaron (price on application). One of the most costly exhibits will be a two-volume French illuminated manuscript of the Histoire Ancienne jusqu’à César and Fait des Romains, adorned with 78 illuminations shimmering with gold leaf and in near-perfect condition. This well-known manuscript of around 1370–80, published by the J. Paul Getty Museum, is offered by Les Enluminures with a price tag of $4.5m. The gallery also offers antique and medieval rings. There is more than a little of the classical in the fire-gilded bronze and ormolu chandelier made around 1800 to the designs of George Morant. Encircling the central flame finial are 12 arms decorated with mascarons – faces intended to frighten off evil spirits. An annotation to the design tells us that this chandelier would have cost £23 when it was made. Today, Apter-Fredericks offers it for £58,000. Paul Storr’s silver-gilt honey pot, cover and stand of 1798, on display at Koopman, is pleasingly simple (£33,000), while H. Blairman offers the exoticism of an Anglo-Indian ebony and ivory pair of chairs. Part of the celebrated suite made in Vizagapatam around 1710 and acquired by Captain Harrison, they passed by descent to the Marquess Townshend at Raynham Hall (£48,000). While modern British art makes a strong showing here, Agnew’s stand looks to the Pre-Raphaelites. 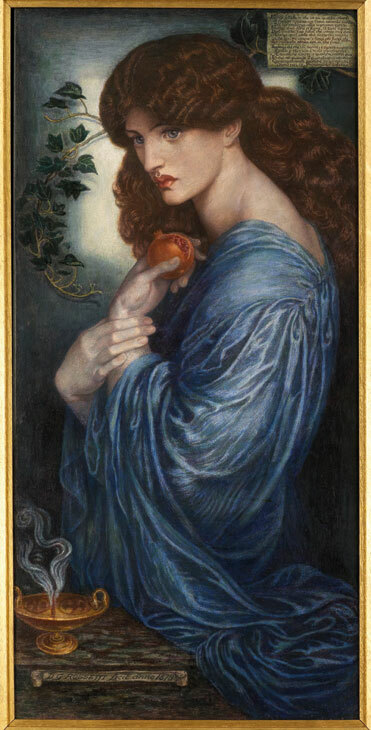 Dante Gabriel Rossetti made eight versions of the large oil of Proserpine now in Tate Britain, all based on his muse, Jane Morris. Here is the only version in watercolour (price on application). As for post-war art, it is the Italians that steal the most wall space. 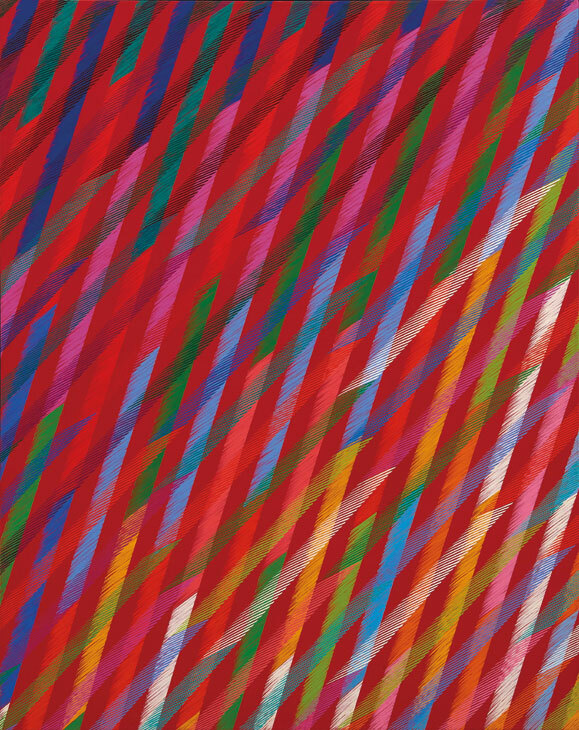 Presiding over Mazzoleni’s stand is a large and vibrant abstract by Piero Dorazio, Vis a Vis I of 1988 (around €200,000). The fair floor, however, belongs to sculpture. A display of three-dimensional works runs down the fair’s central axis, and even beyond the Iván Navarro entrance installation, commissioned by new exhibitor Paul Kasmin, monumental outdoor sculptures by the likes of Allen Jones, Christopher Le Brun, and Paul Morrison pique the interest of passers-by. Hospital Chelsea from 29 June–5 July.